This Sunday, we welcome back Tom Varner for his annual summertime Racer Session. 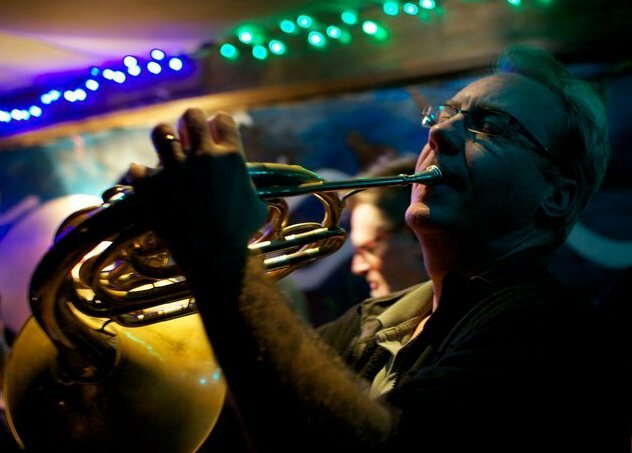 Tom Varner is a French hornist, composer, improviser, and bandleader, who moved to Seattle in 2005, after 26 years in New York. He's played with Steve Lacy, LaMonte Young, John Zorn, Jim McNeely, and many others, with 14 CD's out as a leader/composer. Tom is also a wonderful educator - a jazz professor at Cornish College of the Arts, where he is fully in his wheelhouse teaching the next generation of musicians the foundations of improvisation. He is completely brilliant and a maker of joyful noise. For this session, Tom will be joined by Neil Welch (saxophone), Troy Schiefelbein (acoustic bass), and Ruby Dunphy (drums). Tom also has some ideas for the jam session - read on below for his words! We'll see you on Sunday at 8pm. We will play as a quartet for 35 minutes beginning at 8 pm, and then perhaps YOU might join us for more improvisations at that point. I will be a 'traffic cop,' directing duos, trios, etc, for a while, and then get out of the way and let the Racer magic continue. Hope you can join us!"